The Ellipse ECO 650 IEC comes with four outlets with IEC format for easy connection to typical computer configurations with peripherals. Energy-efficient power protection for business computers With an efficient electrical design and the EcoControl function, which automatically disables peripherals when the master device is turned off, the Eaton Ellipse ECO helps you make energy savings of up to 25 percent compared to previous-generation UPSs. As well as providing a power supply backed up by a battery to keep equipment operating during a power failure, the Ellipse ECO also provides effective protection against damaging surges. Easy integration and installation The Ellipse ECO's extra-flat design makes it easy to install in any office environment: installation options include vertical box format, below the desk, horizontally under a monitor and 19" rack-mounted. Complete peace of mind Periodic battery self-test ensures early detection of a battery that needs to be replaced. 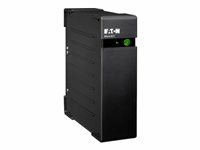 Easy-to-replace battery helps to extend UPS service life. Push-button circuit breaker enables easy recovery from an overload or short circuit. The Ellipse ECO 1200 IEC comes with eight outlets with IEC format for easy connection to typical computer configurations with peripherals.